The course follows along the currently available portions of David's Trail. The entire 50K route spans from Robinson Point Park, through Panther Bay Park, across the Hwy 101 Bridge, turn left at Bidwell Park, then north west on the trail past Take It Easy Resort for several miles. This follows all the points on ﻿this map﻿. 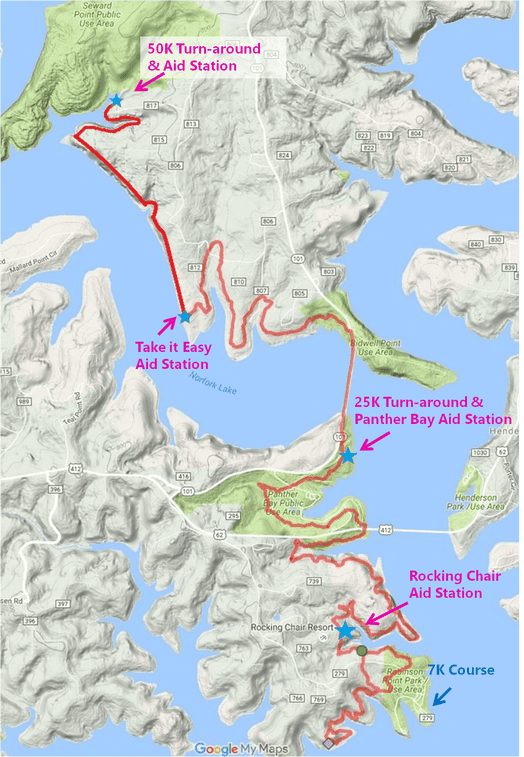 The 25K is the 7K course plus the out-and-back to the Panther Bay aid station. The 7K is contained within the blue circle. There is over 5,000 feet in elevation change along the 25K and 10,000 during the 50K while the 7K offers scenic and challenging terrain through the older portions of David's Trail. Awards: Depends on who finishes when. Likely, 25K and 7K will be 11:30 to 12:00, 50K…that depends on how the day unfolds. Runners not making it through check points at the noted time will be pulled from the course and escorted to the start/finish at Rocking Chair Resort. Mile 18.25 | 50K turnaround: 1:00 p.m.